New signing Damien 'El Dynamo' Clayton is unveiled by the Andy Moore Autocentres/J.E.James Racing team. After a stellar season last year, in which they won many trophies, the Andy Moore Autocentres/J.E. James Racing team could be forgiven for resting on their laurels. 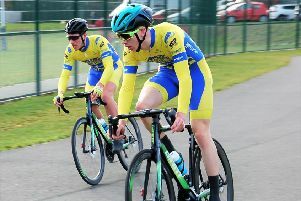 But team principal Andy Moore has decided to raise the bar again and added Clayton to a multi-talented ‘squad that already includes the North Midlands Road Racing League champion, Dean Watson, and the junior champion, Aaron Chambers-Smith. The 26-year-old from Barnsley has been hotly pursued by some of the leading professional teams on the circuit, but has opted instead to join the home-grown amateurs from Chesterfield. 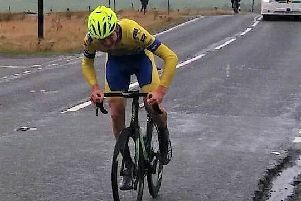 Moore threw Clayton in at the deep end for his debut, a rain-soaked road race on the outskirts of Portsmouth against top-quality opposition. But he produced a ride of premier standard to take a stunning second place that his boss described as breathtaking. The Moore team have also signed Sheffield’s highly-promising Marc Lay, a multi-purpose rider who will offer solid suppoert to the main strike force.